It’s every pet owner’s nightmare: Getting a message that something happened to a pet. 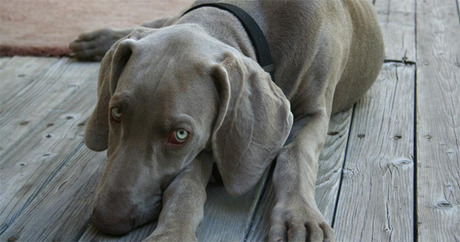 Salt Lake City resident Sean Kendall lived that nightmare when he got a call that his dog, a 2-year-old 110-pound Weimaraner named Geist, had been shot and killed. Thanks to the Internet and social media, stories of dogs being shot by police are all too frequent. But Kendall filmed a video document of his experience, including his confrontation with Salt Lake City police officers on Wednesday, June 18. Warning: Video features adult language. When Kendall arrives at his home he approaches two uniformed officers. He is told police were searching for a missing child and checked his fenced-in backyard. The officer who allegedly shot the dog had left the scene before Kendall arrived. “What was the probable cause to trespass on my property and kill my dog?” An emotional Kendall asks the officers at the scene. “You guys killed my dog! I’ve had this dog for three years,” Kendall says. “He was my best friend and he was shot because an officer couldn’t back the f*** up out of my house. At that point Kendall drops the camera. He later picks it up, walks through his house, and enters the backyard. The missing child was later found asleep in the basement of his home. According to the Salt Lake Tribune, the officer involved in the shooting will remain on active duty during the inquiry. Kendall has retained legal council and demands the officer be fired from the police force. He also started a Justice for Geist Facebook page and an online petition.